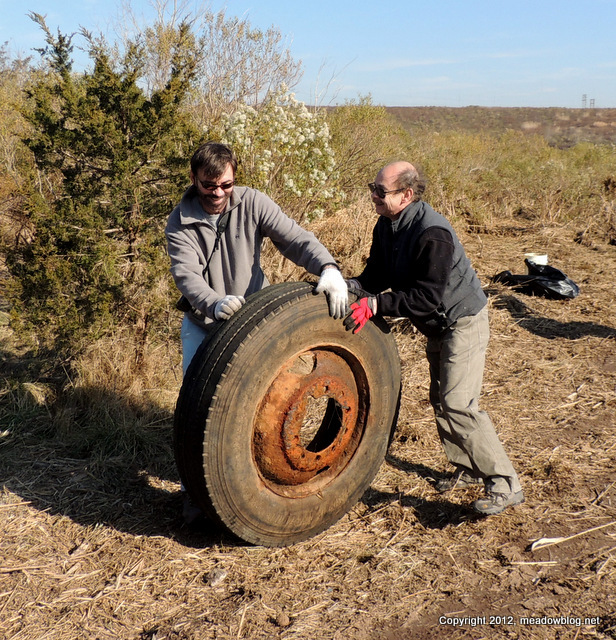 Our next volunteer cleanup is this Sunday, Nov. 25, at Mill Creek Marsh in Secaucus. Scroll down for details. Nearly three dozen volunteers participated in this morning's Harrier Meadow cleanup and put another big dent in the debris strewn all over the 70-acre site. 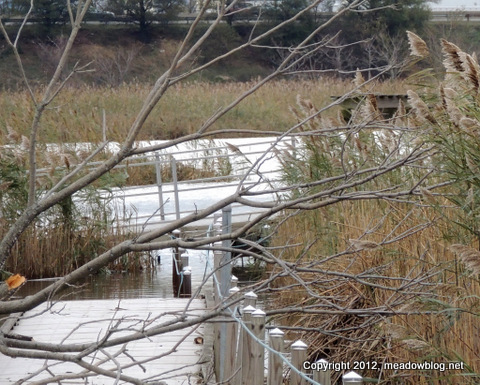 The Meadowlands Commission and the Bergen County Audubon Society wish to thank everyone who gave up their morning to spend time helping the Meadowlands bounce back from Hurricane Sandy. Thank you! Our next cleanup is Sunday at Mill Creek Marsh. Scroll down for details. 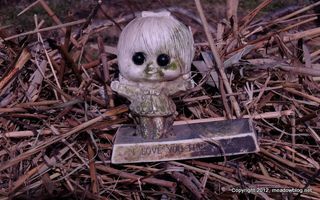 Tomorrow: Photos of some of the weird and odd stuff we found during today's cleanup. Our Next Cleanup: Sunday, Mill Creek Marsh! 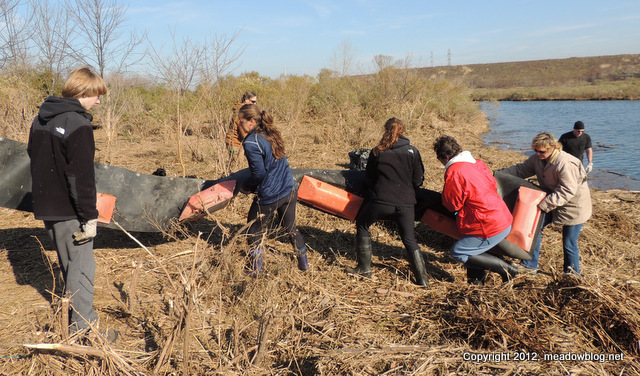 Our next cleanup is Sunday, Nov. 25, at 10 a.m. at Mill Creek Marsh in Secaucus. This beautiful 207-acre marsh and park (see photo above) had several downed trees and lots of washed-up debris from Hurricane Sandy, and we want return the site to a semblance of normal so it can be reopened soon — possibly next week. 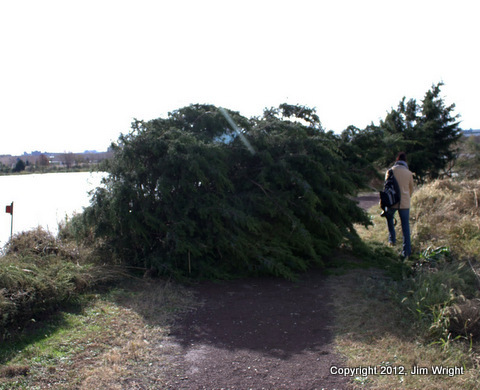 Work crews have cut up fallen trees, cleaned up dead-Phragmites debris, called "wrack," and cleared many of the paths. Alas, much of the site is still strewn with litter of all sorts — and that's where the Meadowlands Commission and Bergen County Audubon need your help. We will be picking up trash and recyclables – glass bottles, metal cans and plastics. Participants must wear work gloves and protective clothing and footwear and sign a liability release. The release will be available on Sunday, and is also ready for download now (upper left-hand corner of the blog). The Meadowlands Commission is providing coffee and doughnuts to volunteers. Directions to Mill Creek Marsh are listed on the left-hand side of the blog. Participants must be at least 16 years old; 16- and 17-year-old participants must have the liability release signed by a parent or guardian. 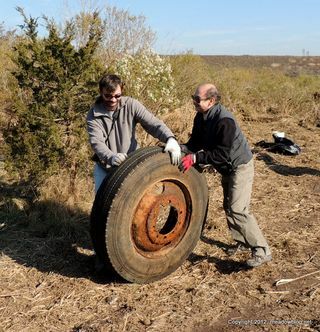 If you would like to receive an e-mail notification of future cleanups, or get more information, please e-mail the NJMC’s Jim Wright at jim.wright@njmeadowlands.gov. Also e-mail Jim if you plan to participate so he can plan accordingly. Jim Wright, who keeps this blog for the Meadowlands Commssion, also writes a twice-monthly column for The South Bergenite. His most recent column is on Hurricane Sandy. In the mid-20th century, this region suffered from unprecedented environmental degradation for decades — including unregulated dumping, burning landfills and horrible water pollution from toxic chemicals and barely treated sewage. We humans have been able to overcome that terrible legacy — a legacy that some thought insurmountable several decades ago. And we will bounce back from Superstorm Sandy as well. 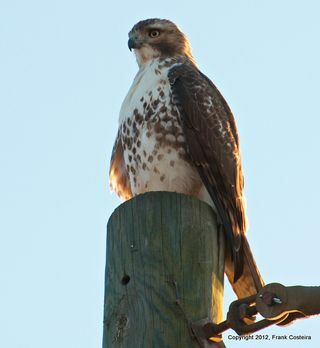 I came across a Red-tailed Hawk along Disposal Road on Saturday and Sunday. No leather straps on him. I attached a pic. BTW, on both Saturday and Sunday there was an ATV and a dirt bike riding on the hill. Is there anyone I can call next time a see someone on the hill, security or local police?